Shadow Of The Dragon: Chinese water dragons prefer shade when it is available. They require special bulbs to provide the appropriate nutrients as they would have received in their original environments, however, Chinese water dragons will use the shade and burrow on an as needed basis. Given sturdy enough branches a Chinese water dragon will also climb and hide in trees and terrarium mounted logs as is their lizardly custom from the forests of China. Lake Lurkers: Chinese water dragons require water bowls from which they will not only drink but also instinctually defecate. As you can imagine this requires either a secondary bowl or daily cleaning. Bowl maintenance is both a chore and a labor of love, if it is neglected then over time your dragon risks sickness from the squalor so you must be willing to clean the bowl daily, however, it should be noted that bowl maintenance is relatively easy and takes only a few seconds. The Food Screams In Terror: Some water dragons are picky eaters and will not settle for meal worms unless they are alive and wriggling or crickets unless they hop and chirp. There is a certain catharsis in watching a water dragon hunt down a pack of crickets and live crickets are inexpensive. The trouble is that crickets are, perhaps to no-one's surprise, noisy creatures. It is recommended that if you value your sleep you have an special location for your dragon's terrarium that is away from sleeping quarters, unless the sound of chirping crickets relaxes you in which case you will get along well with your dragon. Handle With Care: These special dragons are adorable creatures whose beaks seem to radiate a constant smile of childlike glee. However, do note that the glee is merely an illusion and water dragons are incredibly fast creatures. My typical experience of handling spike (my water dragon) was one of stillness and tranquility followed by frantically searching and attempting to wrangle the creature who had inevitably scurried into some nook or crevice. It is recommended that if you wish to handle your dragon or take him/her out for walks (walks/sits/stands) outdoors that you obtain a lizard leash so that your reptile is unable to put him/herself in harms way. 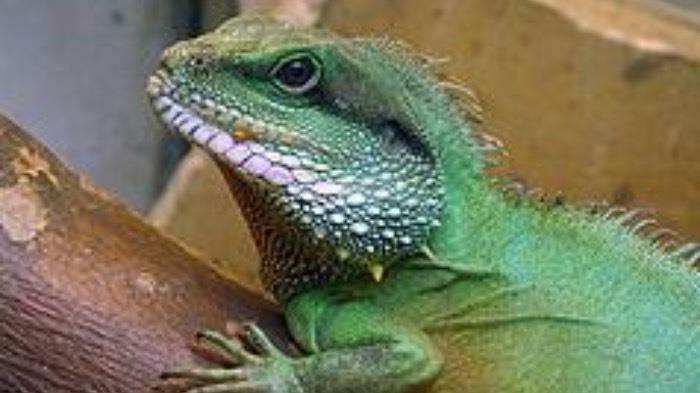 Creature Features: Chinese water dragons have long tales with alternating bright and dark green stripes. When a water dragon is happy their green scales will brighten or dull if the dragon under duress. Chinese water dragons also possess a distinctive spiked fin for swimming and letting off excess heat as well as a third light-sensitive optical organ on their heads. Summary: Water dragons are great fun to have around the home. As with all pets there is give and take: crickets, bowl cleaning, terrarium related expenses, etc... but if you love reptiles then your heart will flutter when you see your special lizard friend turn a bright green in your presence.